Combine the buttermilk, egg, and oil in a measuring cup. Preheat a non-stick griddle to 375° or preheat a large nonstick skillet to medium-high. Add the buttermilk mixture to the oat mixture, stirring until just moistened. Do not beat or over-mix. Pour about 1/4 cup of batter per pancake onto the hot griddle and cook for about 3 minutes per side. 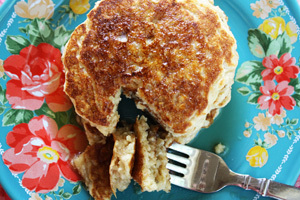 12 Comments on "Oatmeal Pancakes"
Thank you, Jenny. These are the most delicious pancakes I have ever tasted, and they are so easy to make. The only problem in our house is to resist making them EVERY morning! never saw her show, but the Lady can cook! I have tried several of her dishes, first her worlds best meatloaf, it was. because of a medical issue, I can no longer consume the amounts of sodium I once did. I cook everything more or less from scratch – Jennies covers a lot of itches. good food that does not depend on salt sugar or fats to be good and eating and healthy, will be making pancakes in the morning. Been trying some of your others recipies too but this is my first comment.your cinnamon buns are our fav! Please use the link at the bottom of the recipe for substitutions. Hi Jenny….am having the first one…so good can’t wait for the next one in the pan…..so yummy and nutritious! I used just wholewheat flour but didn’t find it dry! Thanks much! I enjoy you! The pancakes will be more dry and more dense made with regular whole wheat flour. I am excited to try these pancakes. I have never had them with oats.